Any health or social care professional could be forgiven for occasionally feeling overwhelmed by responsibility, not least for the implementation of health and safety legislation which can sometimes seem more like an obstacle than a bridge to successful health and safety management. As a leading provider of health and safety training, EDGE Services are committed to bringing clarity to health and safety legislation and is now proud to present the first instalment to our unique ‘Get Focused’ series. In ‘Get Focused – A Guide to Manual Handling Training’, EDGE Services’ expert team unpick the intricacies of current legislation and present good practice as recommended by key professional bodies. We trust that this Guide will become an invaluable and accessible resource to those working in health or social care. 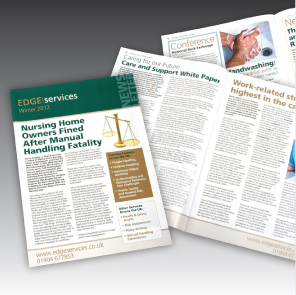 The best news is that this EDGE Services publication is absolutely FREE. Use this link, or call us to request your FREE copy today.